We Self-Publish on Purpose … and It’s Not Why You Might Think. With my longevity in the world of dairy-free, I’ve had the opportunity to receive offers from several top publishers. But, I turned them down. The primary reason wasn’t financial, but rather full freedom of speech. None have been able to say “we won’t touch your work”, all stating that they would probably chop several chapters from my writing to fit with their standard book profile and modify anything that may be controversial. What’s important to me is sharing as much as possible and having books that I can personally use as a reference, too! So, to stay true to my mission, we handle it all ourselves, and at a professional level with design, editing, bulk printing, and distribution – just like the big guys do it! We Keep Our Bones Strong Moving Our Own Books! I can’t wait to reveal more healthy information to you in my books, but you probably already know that weight-bearing exercise is a top way to prevent osteoporosis. And since we handle our own logistics, Tony and I get tons of it by moving 32lb boxes of books! Yes, every book is lovingly schlepped by us before you receive it … this month we had another 4000 book shipment that had to be hand-transported from unloading to storage, and later carried again for shipment out the door. 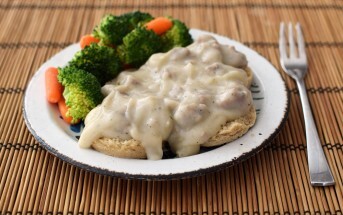 I Love Creating Recipes, but Super Easy Eats are Our Norm. There’s nothing better to me then quick food that satisfies my cravings time and time again. I bet no one would guess that my favorite staple is steamed broccoli. But you probably would have a hunch that another is the old banana-peanut butter shake spiked with healthy goodies. And of course, there’s always something chocolate. 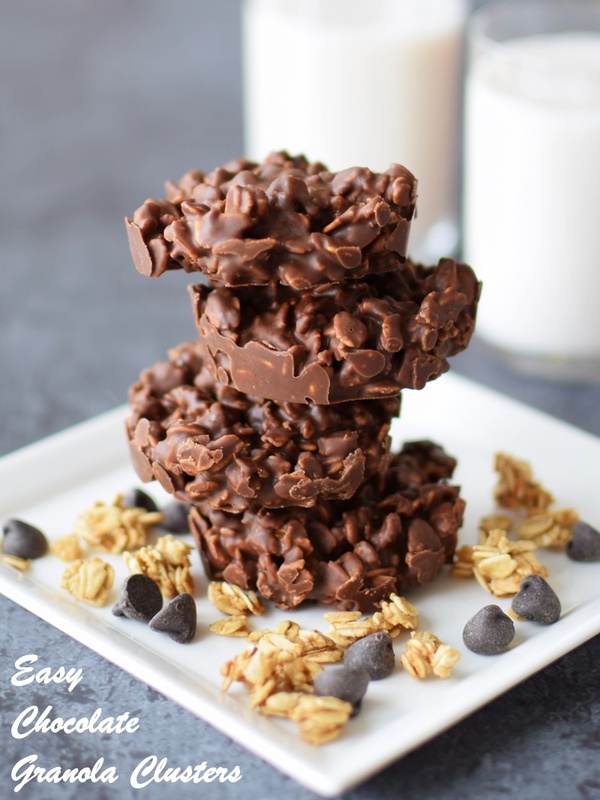 An old love that has returned as of late is the chocolate granola clusters in this post. Just 3 little ingredients and a brief chill-out time, and these addictive crunchy bites are ready for a healthier afternoon treat option! … and it’s unsweetened milk beverage. I try to cook from scratch and keep splurges and shortcuts to a minimum, but milk beverage, like almond or coconut (the two we purchase most often), is so darn convenient, seamless, sugar-free, and affordable. We only use unsweetened for two reasons: recipe creation and lower sugar. When creating a recipe, I prefer to work with as few variables as possible. 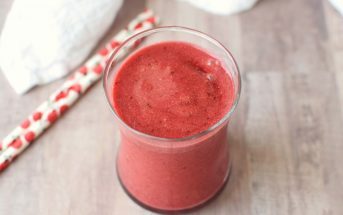 Since the amount of sweetener in a milk beverage can vary by type, brand, and flavor, I find it best to use unsweetened and put the sweetener in the recipe. And as you can tell from those chocolate granola clusters, both Tony and I have a sweet tooth. It’s for that reason that I do not like to consume added sugars when unnecessary. Did you know that dairy milk has 11 to 13 grams of sugar per cup?! 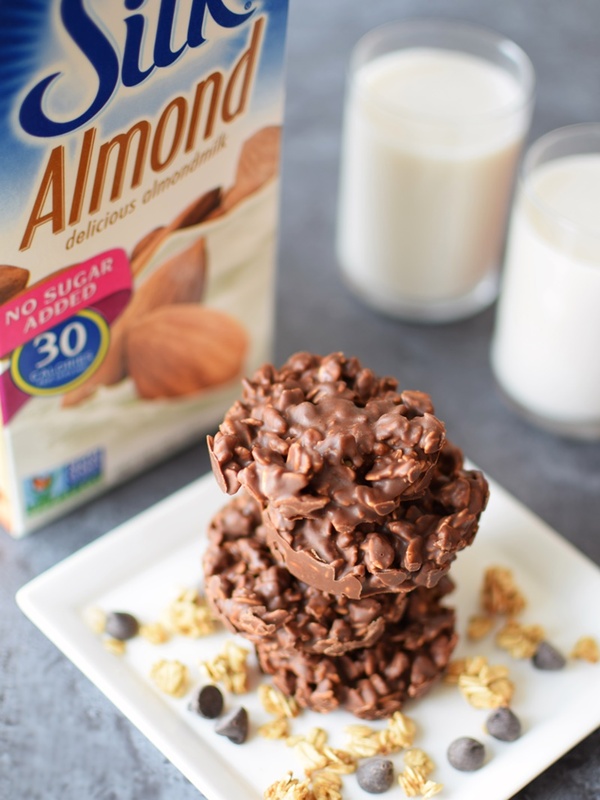 By sticking with unsweetened almond milk beverage, which has 0 grams of sugar per cup, we can enjoy one (or two) of these chocolate granola clusters guilt free! By ingredients, this recipe is dairy-free / non-dairy, egg-free, vegan / plant-based and vegetarian, and is optionally gluten-free, nut-free, peanut-free and soy-free. 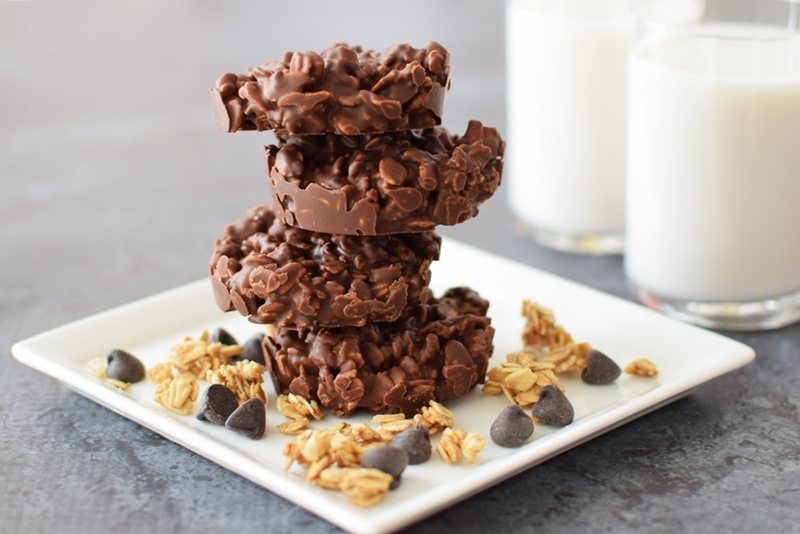 Good Granola: For our chocoholic cravings, I’ve used my leftover Triple Chocolate Granola or Chocolate Chocolate Chunk Granola to make these chocolate granola clusters. However, they’re equally delicious with a more simple homemade granola, and the yummy ones pictured are made with Bob’s Red Mill Gluten Free Granola. Place the chocolate chips in a medium microwave-safe bowl. Heat on HIGH for 30 seconds. Whisk. Heat on HIGH for 30 seconds more. Whisk very well. If needed, heat on HIGH another 15 to 30 seconds, until just melted, and whisk. Do not overheat - the chocolate should be nice and smooth. Stir in the peanut, nut or seed butter until well combined. Gently stir in the granola until every piece is well coated. Press the mixture into molds or drop into clumps onto parchment paper. I use silicone muffin cups, so they just pop right out without any prep. Chill the chocolate granola clusters in the refrigerator for 30 minutes or or the freezer for 15 minutes. Remove from the molds, serve with unsweetened almond milk, and try not to eat them all in one sitting. I prefer to store any leftovers in the freezer for maximum crunch, but they do stay firm at room temperature. I am SO proud of my progress. The effect of reducing other work loads has finally allowed me to focus more on the books every day. I’m meeting and beating writing goals, and just need to get into the kitchen more (will happen starting in mid-November!) for tons of recipe creation. These look so good, I need to make them this week! I’m with you in that unsweetened dairy free milk is a staple in our house. Way to go on the book, I can understand how you wouldn’t want someone to edit your work and you are such a wonderful and informational writer. Can’t wait to check out your book. I love quick and easy recipes! This one is going straight to Pinterest. There are so many brands! 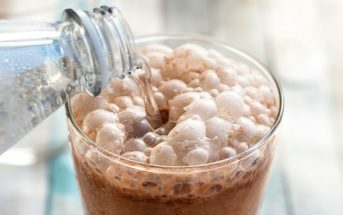 Here is our guide to chocolate – http://www.godairyfree.org/dairy-substitutes/how-to-substitute-chocolate and our product review section with chocolate – http://www.godairyfree.org/product-reviews/chocolate-and-candy. Allergen-safe brands include Enjoy Life, Dream, Pascha, Divvies, and Taza. 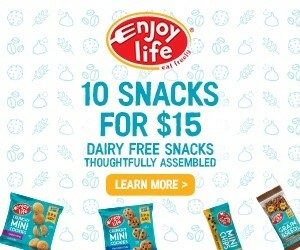 You will see many other brands, like semi-sweets and minis from Guittard that are made without dairy ingredients, but have a “may contain: milk” type statement on them. This just means that they are made on shared equipment with milk chocolate – lines are typically washed and allergen protocols may be in place between batches – so there could be “trace amounts” of dairy. If you are not highly sensitive to these very small amounts of dairy, then those types of brands may be okay for you, too. I loved reading about your back story! I love that you’ve shared the reasoning behind why you self-publish and that you literally do all the heavy work! Literally. That’s not only endearing but also so much dedication and shows you really care about the work you do. Plus, the recipes…! I mean, so much work! We’re thankful for it though! Oooh, I’m all for these babies! And I LOVE that you will never compromise your standards for a book deal! We all value you and Tony so much for that, Alisa! We want to hear EVERY word you have to say! Thank you Shirley! That means so much to me. These look amazing and perfect for the upcoming holidays. Good luck on your book. Thank you Christie, two down, one two to go! Love your standards, I find that very inspirational knowing it is possible without compromising! 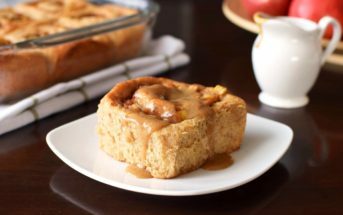 And the treat….delicious – love a simple recipe! Thank you Debra! Yes, I think people would be surprised by how doable it is. I love the fabulous-ness that you can create with just 3 ingredients. Looks a-mazing! Oh my pure chocolate heaven!!! I’m afraid if I made a batch of these I may eat them all myself… will have to practice extreme self control! 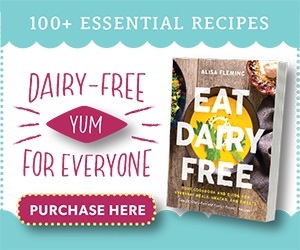 I really cannot wait for these books, Alisa – I admire and respect your process, and your hard work and dedication to dairy free will certainly shine in these books. Thanks Kristina! Very sweet of you to say. And yes, you do need these – they have a crunchy almost candy-like appeal! I love easy Alisa. That and chocolate, not necessarily in that order. Thanks for another great and delicious dairy-free recipe. Yes, easy and chocolate is an irresistible combination! You had me at chocolate 🙂 and yes i can see where having them around would be a problem for me…I eat it if I see it! We don’t even need to see them. I keep them stashed in the freezer and a big batch is gone in days – too, too easy!